Because I was not a camper or hiker and had some physical limitations, I was very hesitant to go on this trip, but the rest of my family was going so I tagged along. 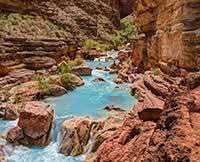 Much to my surprise, I loved it and, with the able assistance of our two outstanding boatmen, was able to hike into all the fantastic sites such as Havasu Falls and fully enjoy the trip and experience everything the Grand Canyon offers. Now that I am home, this 60-year-old city slicker finds herself missing sleeping under the star-filled sky and hearing the hum of the river as background music! My advice to those of you having doubts: throw caution to the wind and hop on board the raft! Don't miss this opportunity.